Dill is most commonly associated with pickles, but it’s also fantastic with salmon, potato salads, veggie dishes, salads, and more! 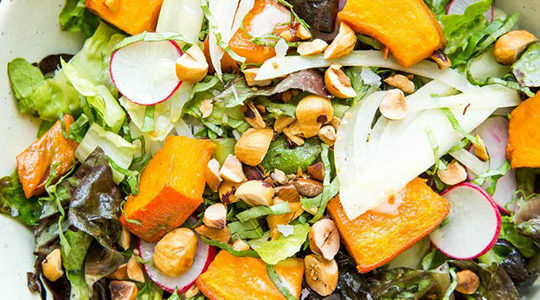 Check out some of these paleo recipes and be herb-inspired. Frittata is an easy way to get a protein-rich and delicious meal going quickly on a busy weeknight, or for a weekend breakfast. This one is colorful with the unique flavors of smoked salmon, minced red onion, capers, fried garlic, chopped dill, and a homemade aioli. This pasta dish is decadent but simple, and it can be on your table in less than half an hour. 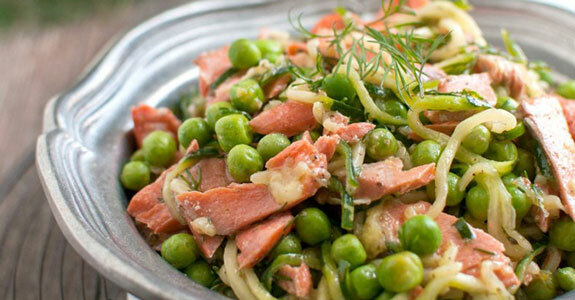 Choose a high-quality salmon, red wine vinegar, Italian seasoning, fresh dill, spiralized zucchini, and peas. Broccoli soup is one of my very favorite vegetable soups. 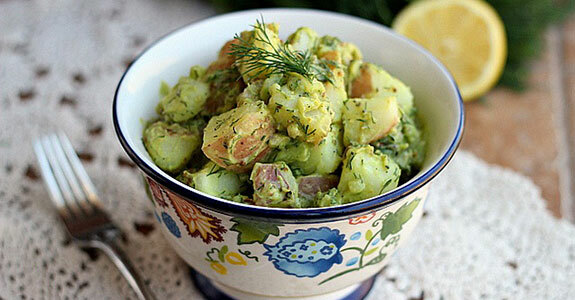 This one is well-flavored with onion, celery, garlic, ginger, dill, and fresh lemon juice. I really think it’s the ginger that creates a flavor unlike any broccoli soup you’ve had before. So bright and spunky! Seasoned with fresh chopped sprigs of dill, salt, pepper, and lemon juice, this simple salad features the combination of sweet and crunchy apple with spicy, savory fennel. The licorice flavor of the fennel really balances the sweetness of the apple, and olive oil helps to round out and meld the flavors. Tzatziki is a Mediterranean sauce that’s usually made with a yogurt and cucumber base and served as a cool and refreshing dip. 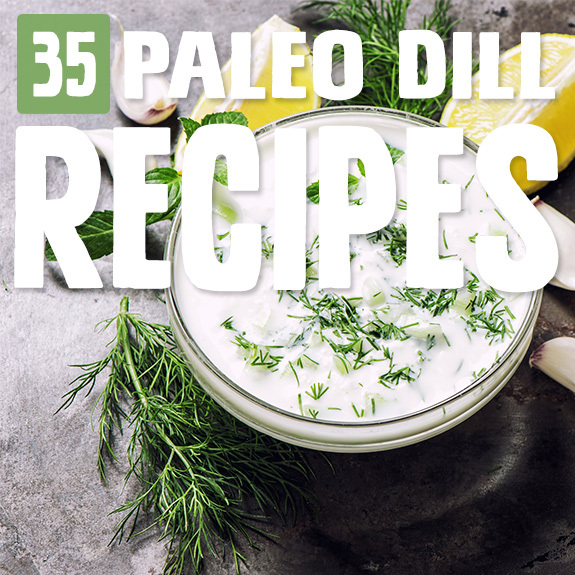 This paleo version doesn’t require yogurt, and is made instead with coconut cream, cucumber, lemon juice, garlic and onion powders, fresh dill, and salt. This salmon meal couldn’t be simpler, but it’s so delicious and impressive to guests because if its lovely presentation. The crust is made with almond meal, fresh dill, and garlic, and everything is cooked in olive oil with salt, pepper, and lemon wedges for serving. 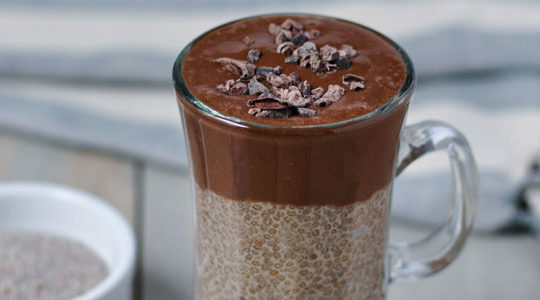 You don’t need a lot of fancy ingredients to make this taste good! Homemade chips and dips are a big thing in my house, because we love snacks but we don’t buy processed foods. These sweet potato chips are easy to make (you don’t even peel the potatoes) and you can dip them in this cashew-based sauce rich with lemon and dill flavors. It’s almost like ranch dip! Try not to drool over the gorgeous color combination happening here with this dip. You don’t need any chickpeas (obviously) and instead it’s made with beets, tahini, garlic, sea salt, lemon, chili flakes, and a topping of fresh chopped dill and chopped pecans. These grilled romaine hearts are absolutely fantastic, and nothing like you usually think of when you think “salad.” The soft boiled eggs and turkey bacon add protein into the mix, along with the flavors of cherry tomatoes, honey, Dijon mustard, fresh garlic, and olive oil. 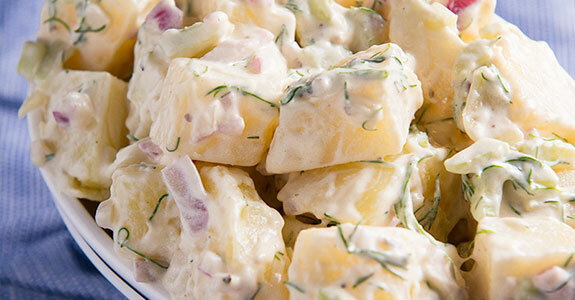 This potato salad has a traditional taste and texture, just like your grandmother’s potato salad. It’s made with Yukon gold potatoes, celery stalks, red onion, fresh dill, anchovies, homemade mayonnaise, lemon juice, apple cider vinegar, sea salt, and freshly ground black pepper. Ever since I first discovered blistered almonds, I haven’t been able to eat them any other way. This receipt is delicious with beautifully blistered almonds, olive oil, minced fresh dill, lemon juice, roasted almonds, and flaky sea salt. These make a lovely and simple side dish or light lunch. Gazpacho is a deliciously refreshing chilled soup that’s perfect for summertime when you really don’t want to fire up the oven or the stove. This one is made with beets, red or sweet onion, garlic, cucumbers, garlic, fresh dill, sherry vinegar, fresh pepper, and garnishes of choice. These colorful coconut wrappers are holding in mixed veggies like red bell pepper, carrots, cucumber, pea shoots, and alfalfa sprouts. They’re served with a homemade dill mayo made from dill and soaked and blended macadamia nuts, which are super creamy like cashews. This stuff is the bomb, seriously. You’ve got deliciously flaky salmon with sweet potatoes, green onions, and herbs, and a creamy dill sriracha dipping sauce (you can use coconut yogurt instead of Greek), garlic, and honey. If you want a full meal, make the balsamic maple Brussels sprouts to go with it! Here’s another chilled soup that’s perfect for spring or summer. This one, however, is of the green variety! To make it, you’ll need cucumber, watercress, garlic, lemon juice, fresh dill, fresh mint, sea salt, olive oil, and plain coconut yogurt to replace the dairy yogurt in the recipe. 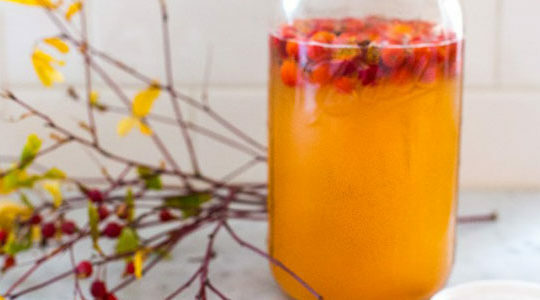 Cultured pickles are awesome, but they can take a week to make. Sometimes you just want pickles overnight! This overnight pickle recipe is made with apple cider vinegar, coconut sugar, white vinegar, dill and mustard seeds, black peppercorns, garlic, fresh dill, and (of course) cucumbers. There must be something magical about the combination of dill and salmon. 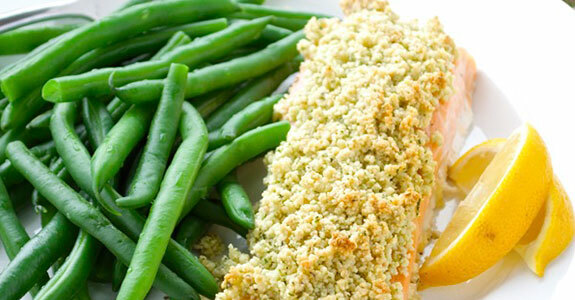 This simple salmon is perfectly seared with sea salt and fresh cracked black pepper. Serve it with a creamy sunflower pesto made with fresh dill, olive oil, basic, green onion, garlic, and mayonnaise. 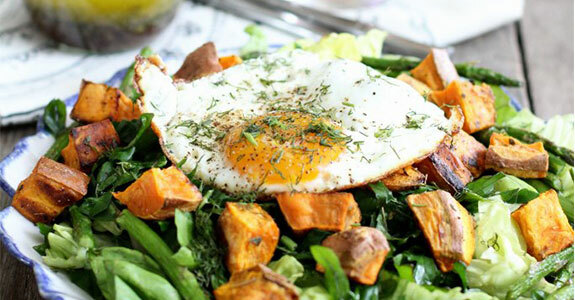 If you’re looking for a way to squeeze more greens into your diet, try a breakfast salad! This one is made with fresh kale and lettuce, roasted asparagus, roasted sweet potato, and a delicious dill and red wine vinegar dressing. For protein and more of a breakfast feel, top with 2 fried eggs. 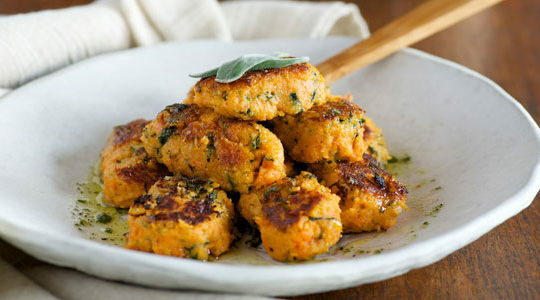 Made with grated zucchini and other veggies like red bell pepper and red onion, along with spices like cayenne and garlic powder, these fritters are super yummy. They’re not complete without a lemon dill mayonnaise made from fresh minced dill. This is such an easy summery salad with only a handful of ingredients, including fresh dill. It’s just sliced cucumbers (peeled in stripes if you want it to look extra pretty), white onion, apple cider vinegar, and olive oil. Good food doesn’t have to be complicated or take a long time to make! These awesome carrots are so tender and tasty with salt, pepper, olive oil and mixed herbs. The best part, though, is the dip that’s part ranch dip, part guacamole, and all awesome. It’s made with ripe avocados, fresh dill, parsley, basil, olive oil, lemon juice, and garlic powder. This salad is made with a special Persian spice mixture of dried mint, dill, rose petals, and black peppercorn. Unless you eat Persian food often, this is likely a flavor sensation that isn’t normally part of your diet. 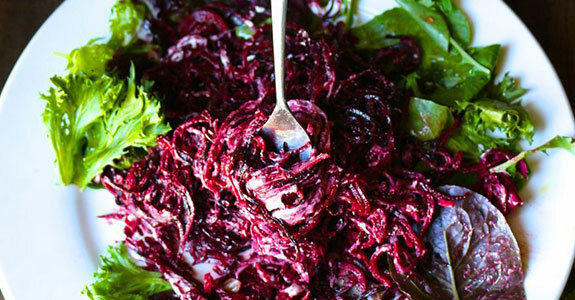 It’s so delicious and easy to make with tahini, beets, lemon, and olive oil. Now if you’re looking for something fancy, this is your dish. These crepes are made with almond flour, coconut milk, ghee, and vanilla extract, and they’re layered with smoked salmon and a dill aioli made with avocado oil, Dijon mustard, white vinegar, parsley, and fresh dill. 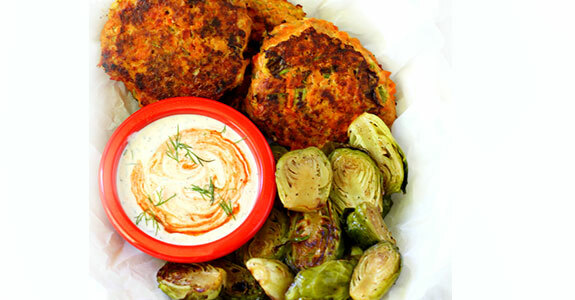 These skewers are deliciously seasoned and drizzled with a yummy yogurt dill sauce. The spicy Ras el Hanout seasonings are perfectly balanced with the cool and creamy sauce, made from coconut yogurt (to replace the diary yogurt), olive oil, fresh dill, mint, and lime juice. After blistering them, my next favorite way to enjoy green beans is cold and snappy, just like in this green bean salad chilled with balsamic vinegar, fresh dill, garlic, kosher salt, crushed red pepper flakes, and freshly ground black pepper. You won’t be able to get enough! 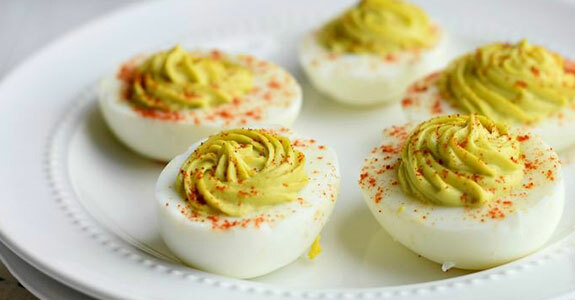 Deviled eggs are a popular picnic food already, but you can make yours even more popular by mixing avocado into the filling. For this recipe, you’ll also use white wine vinegar, dried dill, salt, pepper, and paprika. These have a unique color and flavor, and they’re extra creamy. I love the combination of cucumber, fruit (like pineapple or watermelon) with fresh herbs. It never gets old! This one is great with fresh mint and dill, and it’s made extra fancy with jicama, red onion, olive oil, white balsamic or wine vinegar, and a dash of salt and pepper. 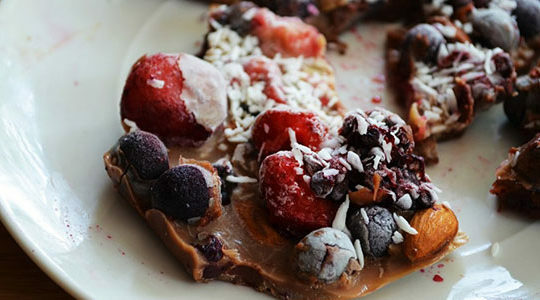 Here’s another awesome breakfast recipe for you, and this one comes together in about ten minutes, so it’s great for when you don’t have a lot of time in the morning but you need something nourishing and healthy. Season your scrambled eggs with curry, fresh dill, oregano, and more! 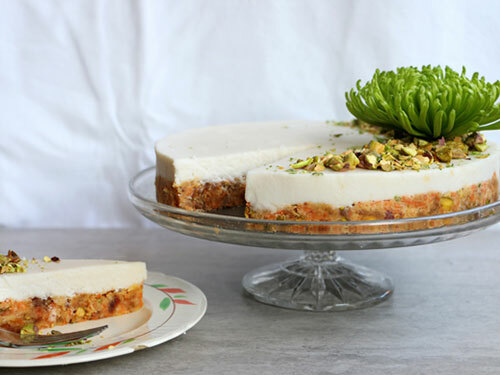 Made with yellow potatoes and turnips for extra nutrition, these fantastic cakes feature full fat coconut milk, garlic, bacon, yellow onions, smoked salmon, white pepper, and a silky topping of unsweetened plain coconut yogurt. They’re simple but also fancy! 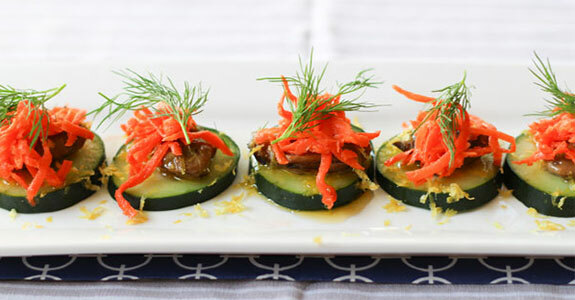 When you serve these to your party guests, they’ll have no idea that you spent only a few short minutes pulling them together with canned smoked oysters, cucumber, raw pickled ginger carrots (recipe included), fresh dill, and lemon zest. So sophisticated! This dairy free cheese is of the soft and spreadable nature, and the base is made from nut milk pulp, olive oil, and fresh lemon juice. You can make it plain, with zesty mustard and toasted sesame, or extra fancy with roasted hazelnut, orange, and smoky paprika and dill. Root vegetables are lovely in winter, because they understand your need to be filled with comforting, sweet, and earthy flavors. This winter soup is made from onions, garlic, parsnips, turnip, potato, carrot, ginger, fresh dill, and coconut milk to keep things super creamy. The combination of watermelon and tomatoes in this salad is unexpected, but awesome. White balsamic vinegar, black pepper, salt, fresh dill, and olive oil enhance the flavors. This salad is a great side dish or lighter meal for hot summer days. This is the potato salad of my dreams with no mayo! The salad itself is made from red potatoes, Dijon mustard, dill, celery, red onion, and sea salt, and it’s coated in a dairy-free dressing with avocado, dry mustard, maple syrup, and apple cider vinegar. Yum! These dill pickles are the “real” kind—not refrigerator pickles, but honest-to-goodness lactofermented dill pickles. You’ll need small cucumbers, garlic, dill, red pepper flakes, brine, and a grape leaf—the grape leaf is the secret to keeping them crunchy.